Mosquitoes have long been present in our environment, but the past few years have seen the proliferation of new varieties that can spread serious diseases such as West Nile Virus and Zika. What can we do to avoid breeding mosquitoes in our landscapes? Survey your property weekly and dump standing water from saucers under potted plants, buckets, unused tires, bird baths, toys, yard clutter, and other containers where water can collect. The tiny Aedes aegypti mosquito can breed in a very small amount of water. Its eggs can remain viable in a dry state for a year and then hatch when water is present. 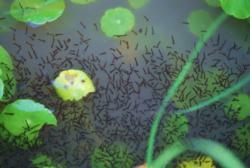 Standing water indoors can also provide a breeding spot for mosquitoes. They have been known to reproduce in the cups of bromeliads where water is often poured. If you have rain barrels, be sure the the overflow opening as well as the intake is screened. There are remedies for landscapes that include ponds. Dunks, mosquito fish, and granules for bromeliads are available. Contact Orange County Mosquito and Vector Control for more information and to make a service request. What can we do to avoid being bitten? 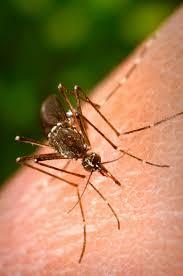 Wear long sleeves, long pants, shoes and socks if you cannot avoid being in a mosquito affected area. Use an insect repellent containing DEET, Picaridin, IR 3535, or oil of lemon eucalyptus.